Jake live in session performing an impressive instrumental track that he wrote. Jake shows off his technical prowess with some live improvisation! Original drums-led instrumental track written and performed by Jake. Jake is a virtuoso session drummer who was born into a creative and musical family. His Grandfather, the guitarist Geoff Bradford, has been called 'a pioneer of British Blues', and his sister is a talented singer. Jake got his first kit at the age of 9, and by age 15 had obtained a distinction at Grade 8 drum kit and began touring with live bands. Since then Jake has recorded numerous albums and DVD's with various artists, and worked with lots of clients around the world providing live drums as an online session drummer. He performed at the inaugural High Voltage Festival 2010 (in the company of such acts as ELP, ZZ Top, Marillion and Dweezil Zappa) at just 17, and in the same year was voted 5th best drummer of the year by classic rock magazine behind such luminaries as Neil Peart, Mike Portnoy, Gavin Harrison, and Nick D'virgilio. 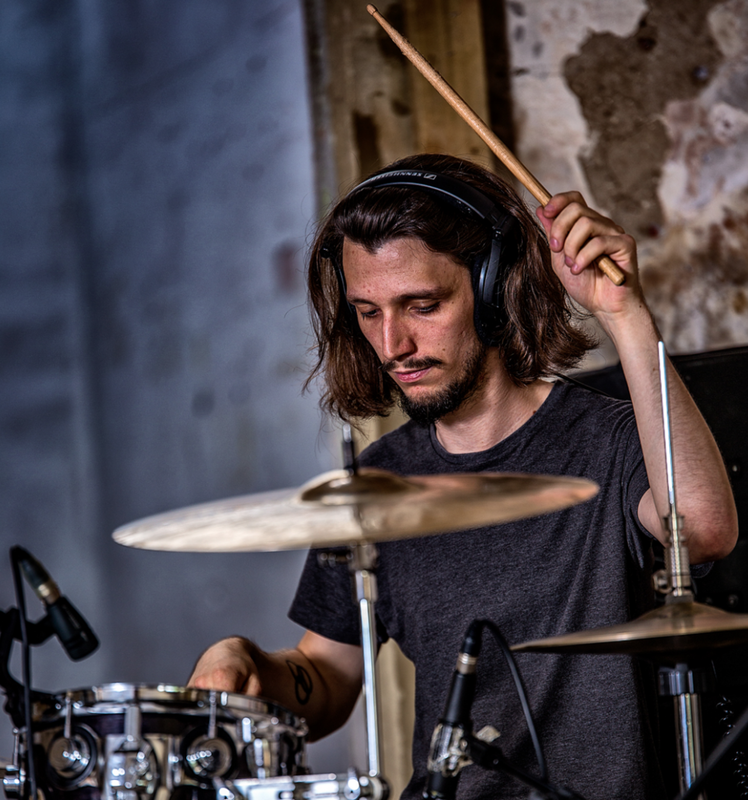 Jake records all of his drum sessions for Kollab clients out of a top of the range studio in Camden, and has access to award winning engineers if production is also required. Take a look at some of his videos on this page, which were all written and performed by Jake. These show not only his virtusotic skill and groove but also the dedication and passion that Jake brings to the kit. Jake has recorded for artists of all genres and is happy to discuss your project first, so don't hesitate to get in touch below. A great track starts with the drums, so If you are looking for a live drummer who can really give your track the foundation it needs then speak to Jake! Hire Jake as your online session drummer - all live drum tracks will be recorded remotely for you and your files delivered via email in just a few days. No need for expensive studio fees! Please note that prices vary depending on each project - length of track, how many drum tracks/takes you want, etc. It's difficult to give a 'one price fits all' option when creating music, so please contact Jake below for an accurate quote. To message Jake directly about your project, simply click 'Make Enquiry' below and he will reply ASAP with an accurate quote. Thank you! Jake will get back to you ASAP.